As an exercise in the power of the law of unintended consequences, the reign of Augustus the Strong Elector of Saxony and later King of Poland is amongst the best. 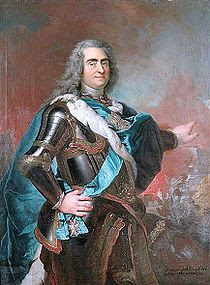 Augustus reigned as Elector in Saxony from 1694-1733, he was fortunate enough to be elected as King of Poland three years into his reign in 1697. As King he commanded the entire resources of the Commonwealth of Poland and Lithuania- at that point one of the great powers of Europe (and beggining its great decline until its demise as a state in 1795). To become King of Poland though, Augustus had to renounce his Lutheranism. Like Henri of Navarre, Augustus found that Warsaw was worth a mass and became a Catholic but the consequences of this religious change in Saxony were vast and important for the future history of Germany. As Jonathan Israel tells it (Radical Enlightenment p.106-7), Augustus's decision to become a Catholic meant that the court in Dresden refused to accept Lutheran censorship of books and manuscripts within the electorate. As Leipzig, within Augustus's domain, was by 1700 the largest book trading city in Germany (to compare in 1700 Leipzig had eighteen publishing houses and booksellers and a whole community of binders and other crafts, Berlin reputedly had one bookshop and Koenigsburg, a university town, but three)- the knock on effect was to change the way that the German book market itself operated. Moving censorship from the religious to the secular arm did not cease censorship: the works of Spinoza, Radicati and others were still proscribed, but what it did was to cease confessional censorship. So long as Calvinists, Lutherans, Catholics and even moderate enlightened Christians were willing to refrain from attacking each other, they might be published in Saxony. The outcome of course, allied with developments in other Kingdoms such as Prussia under Frederick the Great was to change German publishing and therefore German intellectual life. Augustus the Strong's conversion had an important impact therefore on the enlightenment during the early eighteenth century: Warsaw may have been worth a mass, it was also worth a library. This prompts two reflections: which I think are also substantiated by Israel's work. The first is that the early enlightenment proceeded along physical channels of book selling, manuscript smuggling and letters. Without those physical channels and the markets in Western and Eastern Europe that were willing to accept the books and manuscripts and devour them, there would and could have been no enlightenment as we understand it. The second was that that was all facilitated by a movement of censorship across the continent from the religious to the secular arm: and by disputes and politics which had nothing to do with the enlightenment within the secular arm. Augustus's Polish crown is one example, the fortunes of Neapolitian intellectuals in Austrian and Spanish Naples is another, we could add others to the list but I think that is enough to prove that broader point. Intellectual life was at the mercy of politics and that meant that there was no consistent response from the ancien regime to the enlightenment. Israel's work illustrates both the ways the enlightenment was transmitted and the complicated ways that the censorship of that transmission operated. David Simpkins has written a short biography of an archer called Robert de Fishlake for the database of English soldiers in the Hundred Years War. Robert de Fishlake is an important man because he is one of the few English archers that we know much about in the period. English archers were one of the great weapons of the medieval English King's army- they were largely responsible for the victory at Agincourt most famously. What Simpkins illustrates through his biography of Fishlake, through the use of a record in the Court of Chivalry in 1410 and the use of muster rolls from 1381, 1387, 1388 and 1404. Fishlake testified in the court of Chivalry that his service in arms began in 1378 when he was 16. Therefore we can guess that he was an archer in 1378 as that is the rank he held in 1381, he also served in different retinues in the late 1380s. By 1404 he had been promoted to become a man of arms and by 1408-10 was sufficiently high in status to testify in the court of chivalry. Simpkins draws out two conclusions from his evidence. The first is that there was a kind of career ladder for men who went to war- they would progress from archer to man at arms and some of them maybe further up the ladder. Fishlake demonstrates the way that war could become a means to social advancement in the late 14th and early 15th centuries. Secondly Simpkins finds plenty of other Fishlakes serving around the same time- a Hugh Fishlake who served earlier in the 1370s, a John Fishlake who went to Agincourt with King Henry V. The idea that there were socially mobile military families is not implausible: but to find one and to demonstrate through court and muster records that at least one member did secure profit from war, starting low and finishing middling is important. There is a further aspect to this which I think is worth noting: Fishlake was summoned to the court of chivalry because he had served the Hastings Family from the 1380s onwards, but he had also fought with the Earl of Arundel's retinue and Thomas Mowbray, Earl of Norfolk's retinue. This suggests that when a man's lord was not fighting or not involved, an enterprising soldier might find another commander to take him to war and to profit. Perhaps rather than imagining 14th Century warfare as the clash of retinues or patriotic soldiers, we should remember that many on all sides would have been military entrepreuneurs, out to support their patrons and their country, but also crucially themselves. Harvey Mansfield recently suggested that Quentin Skinner and John Pocock were historians who suggested that "ideas can be traced to prior conditions that are not ideas, such as economic forces or, more particularly for them, political interests." Professor Mansfield misunderstands the point of the Cambridge school of political thinking, which breaks down the distinctions between theory and practice, wilfully: if however he or those who read him wish to find an elucidating account of the way that economic and political forces can actually sustain ideas then they should turn to Peter Burke's book on the Italian Renaissance. Burke's account of the Renaissance is an attempt to place the Renaissance in a wider context: it is an attempt to answer the question, why did a renaissance happen in Italy over two hundred years at the end of the Middle Ages? Why did extraordinary figures like Leonardo, Michelangelo, Machiavelli, Donatello, Guiccardini, Contarini, Botticelli, all emerge from the same corner of Europe at the same time? Why was there a concentration of people with good ideas from one particular society? Burke's answer is painstakingly and elaborately constructed. He is one of the most elegant writers of history around today- his account is short (only 256 pages long) but testifies to a rich exposure to the sources. Burke's basic contention is that in Italy between 1400 and 1550, a fortunate series of structural events came together which helped produce the Renaissance. Part of those structural events had to do with the organisation of society- so for example he emphasizes the ways that Italian city states were more hospitable for the arts than the feudal communities of Northern Europe. In Italy, the artist joined the merchant in living in the gaps of the traditional feudal understanding of the world in which everyone was a fighter, a peasant or a priest. He talks about the ways that art was structured itself- it became entrepreunerial with great artists having workshops in which apprentices worked. Indeed Burke demonstrates that the urban world of Italy thrived on the model of the apprentice and master relationship with dozens of clientel relationships prospering in each individual city. He shows how urban Italy was- the most urban region of Europe at the time and how this helped sustain an art market. How disruption in such urban centres, whether in Florence in 1494 or Rome in 1527 may have effected not merely art but also political thought: Guiccardini began his own inquiries into history with 1497 for example. Burke is attentive always to caution though- for him the world of the Renaissance was complicated and not simply driven by social pressures. Society provided the backdrop against which Renaissance art was conjured up. Like Rahe, whose book I have just reviewed, Burke is attentive to hidden meanings and yet unlike Rahe he provides evidence that contemporaries shared his attention. Take the painting I have illustrated this piece with. Its title is the Virgin, Child and Saint Anne. The Virgin sits upon St Anne's lap, restraining Christ from grabbing on to a lamb. 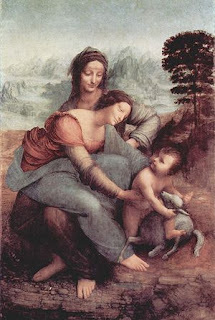 In one sense it is an image of maternal love: yet Burke cites Pietro da Novellara writing about an early version of the picture to Isabelle d'Este giving his interpretation. The 'may' is Novellara's word but it is a word that Burke stresses that we should appreciate. Such caution about a hidden language is opposite to Rahe's extravagance with hidden meanings. Burke also seems more atuned to a variety of languages- from the religious (more than half of paintings from the Renaissance sample of 2000 Burke has looked at were of the Virgin) to the classical and political and even to the alchemical. This fecundity of meaning is an interesting part of Burke's book and something he is unwilling to endorse without further proof: like any good historian, Burke suggests ways we can translate the past but stresses how much of it remains untranslatable. Burke's thesis is bold- he links commerce, commercialisation, capital, empire and republicanism together. Some of the details do not convince: Burke takes the line that republics foster artists whereas monarchies offer scope for patronage- that seems a sensible argument and yet it is worth saying that Burke devotes perhaps too little attention to fortifying it. Voltaire would have disagreed, suggesting the Age of Augustus and the Enlightenment of Louis XIV as counter examples. Again Burke is right that Italian art declined as Italian patrons moved from being entrepreuneurs to rentiers- but even he admits that the process had not completed by 1680, long after the Dutch and possibly English had passed Italian art. The argument that art and culture are products of recession (Lopez) is refined by Burke- he denies that people invested in art, but suggests that a lack of other investment led to surplus wealth- the Buddenbrook complex writ artistically, but it would have been interesting to hear more about spending patterns in merchant houses from this perspective. A short book leaves you vulnerable to not taking up every avenue and exploiting the potential to answer every doubt- but this is a tour de force that Professor Mansfield would not appreciate. In a sense what Burke does, the same enterprise that Machiavelli, Hobbes, Marx and others were engaged in, is discuss what type of society best produces creativity. We may dispute his answer: but the question as he discusses is as old as the condition that gave rise to it- Vasari and Bruni during the Renaissance were the first to contemplate why the Renaissance should have happened. I do not want to leave anyone with the impression that Burke does not write about or care about the art he studies. This is not a dull study which focusses away from the subject it studies- rather Burke is fascinated by the art. He is interested in the ways that artists thought- the movement towards rules of perspective and eventually towards mannerism. He is fascinated by what art meant- Michelangelo's David for instance fitted into a neat model of Florentine portraits of David symbolising their weakness and virtue against Milanese monarchist Goliathan imperialism. He writes illuminatingly about the way artists were educated- few knew how to read and commissions may have spread education. This is a book where the focus is wide not narrow. Burke's work is also filled with illuminating detail. Italian painters were imitating classical models without having any to hand- all the Roman paintings that we have date from eighteenth century finds. We do not know much about major strands of art or performance because they are naturally of their time: we are told of sermons in which the preacher rode in arms to his congregation or elaborate festivals in the great cities, but we have no idea what these looked or sounded like. The book is a major acheivement with a lot packed into a small volume- but what it does do is turn us back, particularly in the conclusion where Burke matches Italy to the Netherlands and eighteenth century Japan, to major questions about society and creativity- about how clusters are caused and why they persist. Machiavelli thought of politics as a sinister art, filled with treachery and ruled by fear, not by love. Satyajit Ray in his Chess Players creates an image of politics that is similar in many ways. He deals with the events of 1856 in the Kingdom of Oudh. That kingdom was one of the last not to be incorporated into British India, an ancient treaty bound Oudh and Britain together in common allegiance to each other. Yet members of the British elite in India, particularly Lord Dalhousie the Governor General and the British Resident in Oudh, General Outram, wanted to conquer the province and annex its revenues. The crown of Oudh had always supported Britain but fiscally even such support falls short of the kind of control the British wanted. 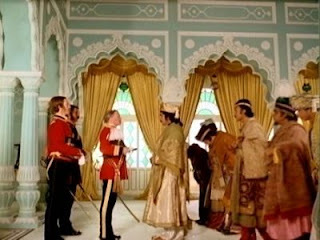 (Some of these characters are fictional- Ray's picture of the status of Oudh before 1856 is not entirely incorrect, but I evaluate this film as a piece of political theory rather than history). The British desire to take Oudh and its acheivement are played out within the confines of the film in which arguments about law, good government and ability to govern are made against the background of a traditional state headed by a dilettante King. On the other hand, Ray's film has a second story which runs alongside his first- two chess players play each other constantly throughout the film, oblivious to the action around them. One might think that Ray was making an analogy between chess and politics: he is not making that analogy at all. There are analogies made by the characters- particularly between the 'fast chess' of the British with its queen (instead of a minister) and its promoted pawns against the 'slow chess' of India- but I do not think that Ray wants us to see through the eyes of his characters. His film is an objective rather than a subjective view: the camera sees from in front of or behind the characters and an omniscient narrator is provided to prompt the audience to distance themselves from and question the truth of the characters. Chess though does become a sort of analogy for the movement of politics: the British general, General Outram, does play a game of chess across the board of the Indian state and eventually he captures the King. But the key thing here is that he does win because he actually succeeds, his position is dire from beggining to end, he wins because noone else wants to win- and because noone else gets involved. Politics like chess in this sense turns into a contest between two men battling over a board. The interesting thing about that struggle is that both in the microcosm and the macrocosm, the chess players are oblivious to events outside the game. They do bring in those events but only as ways to disrupt the game- not to overcome it or obliterate it. One of the two chess players is comically humiliated by his wife- conned into failing to see she is having an affair. The other more tragically cannot seem to make any emotional connection with his wife because his only emotional connection can be with the board. The Chess game is an arid metaphor for life because it takes place outside of the currents of real life- its purpose is to exclude real life- as one character says we play chess because we do not want to see our own faces in the light. In a sense what happens in the Kingdom is the same: the two chess players and the whole population are oblivious of the British intentions, the game is played above and beyond them. In a sense therefore the politics of this are simple- engagement would frustrate imperialism, the crown calling its people into action would force General Outram out (this is a film made at the time of Vietnam and the successful anti-colonialist struggles of the mid-century). But there is another complicated strand to this in which politics, like the chess game, become unreal- who cares who rules if the only consequences are battles between frivolous old men over tables. This is a perceptive attack on autocracy- both colonialist and Indian. Reviewers are right to say that almost all the characters are portrayed sympathetically- Ray's eye sees their perfections as well as their blemishes. The film is truly humanitarian. The British officer, played wonderfully by David Attenborough, is sinister but also sincere in his patriotism and his impatience with the follies of an 'oriental monarch'. The monarch may be frivolous- with his 400 concubines and 29 pleasure wives- but he is also a conspicuously good man, caring more for poetry than for anger. The chess players are comic not because they are evil or malicious but because they are good men trapped in blindness. Rather than being an attack which attacks personalities, Ray's is so much more powerful because he attacks the flaws in personalities and positions. He acknowledges and shows that these are rounded people, whilst letting us see their flaws. If Aristotle argued that monarchy should exist when a perfect man comes to government, Ray shows that there is no such thing- and that monarchy or empire without such degenerates into a game of chess. Ray's humanism comes through thus both in his evocation of participation and in his description of the wider tapestry of life: he wants us to see social community as a worthwhile thing, that the chess players have forgotten wrapped in their game, that General Outram has neglected wrapped in his manoervre and that the King knows intuitively but does not know how to provide. This is an excellent film and I will write more about it- but for now, I lay this chess set aside! The County Palatinate of Durham was a unique jurisdiction in medieval England. Independent of the crown and ruled by its bishop, the local nobility asserted their independence of the rest of England and of obligations such as knight service that other nobles held. What this book review in the Medieval Review explains is that that resistance was grounded upon a political motive- which should be obvious to most- but also upon a spiritual language. The nobility asserted their rights as the successors to those who had guarded the remains of St Cuthbert as they made their journey from Lindisfarne to Durham under Viking assault. What you have here therefore is the independence of a part of England being buttressed and described by a saintly and spiritual motif: religion provides the legitimacy for the County Palatinate to exist and exist free of the interference of London and the rest of the Kingdom.